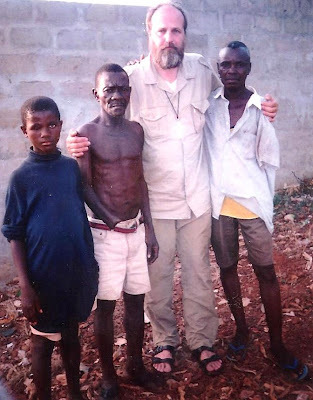 As we prepare for our next journey to Sierra Leone, I was digging out travel gear when I came across some photos of the first entrance into Sierra Leone, May 2000. This was Fr. Seraphim's first trip to Freetown, the beginning of Nazareth House's involvement in that country. He went there to pray, to physically pray in the midst of the turmoil. What he experienced captured his heart and went on to capture us all. Go to our website page entitled Houses of Nazareth (chapter & affiliates) scroll down to the bottom of the page and click on the link labeled "double click here for more pictures" located under the picture of little Sheku (with worms) & Kadijah. This link will take you to more photos of the first images of Nazareth House's beginnings in Sierra Leone. 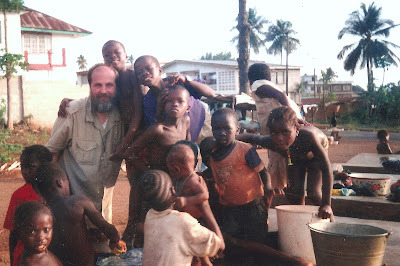 In May 2000, the streets of Freetown were deserted. Though there is a tremendous amount of growth and work to be done in Sierra Leone today, much has improved since the early days. Your contributions through your support of Nazareth House Apostolate benefit Sierra Leone in many ways and help it to continue to take steps forward. Thank You. Spread the word, give today!